In the 1960/70s, Bovingdon was used in the production of four World War II films, The War Lover (1962); 633 Squadron (1964) Hanover Street (1979) and Mosquito Squadron (1969). Although flying ceased at the airfield in 1969, it was also used to film parts of the flying car scenes in the James Bond film ‘The Man With the Golden Gun’ starring Roger Moore, when the palm trees fold down as it takes off. The site was also used in the 2016 Star Wars spinoff film Rogue One, representing the planet Scarif. On television it served as the location for at least one black and white episode of The Avengers “The Hour That Never Was”, starring Patrick Macnee and Diana Rigg featuring Gerald Harper and Roy Kinnear as well as the 1980 Blake’s 7 episode The Harvest of Kairos as the surface of the planet Kairos. An airstrip at the airfield is also reputed to have been used in the opening credits of the 1967 television series The Prisoner in which Patrick McGoohan is seen driving a Lotus Super Seven car past the camera at speed. It has continued to be used in various TV shows up to the present day. The War Lover a British black-and-white war film directed by Philip Leacock and written by Howard Koch loosely based on the 1959 novel, The War Lover by John Hersey, altering the names of characters and events but retaining its basic framework. It stars Steve McQueen, Robert Wagner, Shirley Anne Field, Ed Bishop and features a young Michael Crawford. Plot: In 1943, Captain Buzz Rickson (Steve McQueen) is an arrogant pilot in command of a Boeing B-17 Flying Fortress bomber nicknamed The Body. While stationed in England during World War II, one of the bombing missions is aborted because clouds obscure all potential targets, but Rickson ignores the order to turn around and dives under the clouds. He completes the mission, at the cost of one of the bombers in his squadron and its entire crew. Rickson revels in the fighting and destruction; when he is assigned to drop propaganda leaflets on a later mission, he makes his displeasure felt by buzzing the airfield. His commanding officer tolerates his repeated insubordination because he is the best pilot in the bomber group. Even so, when he asks the flight surgeon his opinion, the latter is uncertain whether Rickson is a hero or a psychopath. 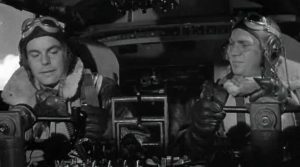 However Rickson’s crew, especially his co-pilot, First Lieutenant Ed Bolland (Robert Wagner), trust his great flying skill. Read more on all the top twelve films on Bovingdon Airfield.